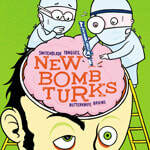 From Columbus Ohio, New Bomb Turks formed in the early 90's and released their first full-length record, Destroy Oh Boy! on the infamous Crypt Record label. 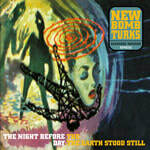 Pulling from such diverse influences as the Dead Boys, The Pagans, Devo and The Stooges, the Turks created a raw tight garagey-punk sound all their own (The Hives say the Turks were one of their main influences). Led by the energetic front man Eric Davidson, the band put on riveting live shows, often dragging unwilling audience members into the onstage fray by stealing their glasses or hats. 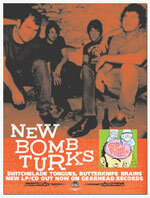 The band recorded 10 albums on various labels including Epitaph, Sympathy For The Record Industry and Crypt and finished out their career on Gearhead Records with The Night Before the Day The Earth Stood Still and the out takes and b-sides collection Switchblade Tongues and Butter Knife Brains before calling it quits in 2005. If you’d like to read a great in-depth history of this band, check out this amazing article by Kortney Jmaeff. The band occasionally reforms to play festivals both in the US and abroad. ​If you’ve never had a chance to see the band live, check out some of their awesome Youtube Videos.